Confessions of an eBay Bride » Blog Archive » Why don’t you go where Fashion Sits? Why don’t you go where Fashion Sits? Bring on the Glitz is, officially, my favourite online merchant for inexpensive, yet fabulous costume jewelry. Period. And, since I don’t often make declarations in absolutes, I think you should go there now and buy things. Shiny things. Pretty things. Things you probably don’t need. But you won’t feel bad for indulging in a wee bit of retail therapy when you see the prices involved. In my travels through eBay for accessories to go with my unbelievably fabulous (yes, I AM allowed to boast: My Blog, My Rules) dress (which, for obvious reasons I can’t really say too much about until after I’ve actually worn it), I happened upon a vendor who had some dazzling bits of flair for sale. I’d previously purchased a necklace & earrings set from another vendor that, while quite pretty, just didn’t have the pizzazz I had expected. It looked exactly like the photo posted online, but it just didn’t quite have the shine I was hoping for once it arrived and I saw it in person. It was cheap (US $11.95) and, sadly, it looked it. But you live and learn. Not every find is a gem. Yes, I punned. I’m not proud. But I’m sure LX is somewhere giggling with delight. All of Janice’s (I feel we’re on a first-name basis now since we’ve emailed back and forth and I’ve now made several purchases; she may feel differently – but no restraining order or accusations of cyber-stalking have been issued, so I’m sticking with my assumption) products are lead and nickel-free (a big deal if you have even a slight allergy to either) and have a protective surface coating to keep wear & tear to a minimum. Bring on the Glitz stocks tiaras, bridal jewelry sets, bridesmaid sets, and even items for the wee ones you might have asked to be in your wedding party. But this isn’t exclusively a Bridal Shop. There’s an incredible variety of fashionable & fun costume jewelry to be found. Everything from the quirky (why I haven’t purchased this, yet, I’m not entirely sure) to the elegant is on offer here. Lately I’ve even noticed a few really cute body jewelry items have crept their way into the store inventory. Almost makes a girl want to do extra crunches and pierce something. Almost. And if you happen to know anyone who holds fast to not wanting to pierce even their ears, you’ll know how challenging it is for them to find earrings. It never occurred to me that it might be tough finding clip-on earrings for a special occasion (or, at all, really) since I’ve never known anyone with pristine lobes. Until now, that is. My future mother-in-law is one of those ladies who just never got around to getting her ears pierced. So I’m tickled pink to have found this treasure trove of goodies. 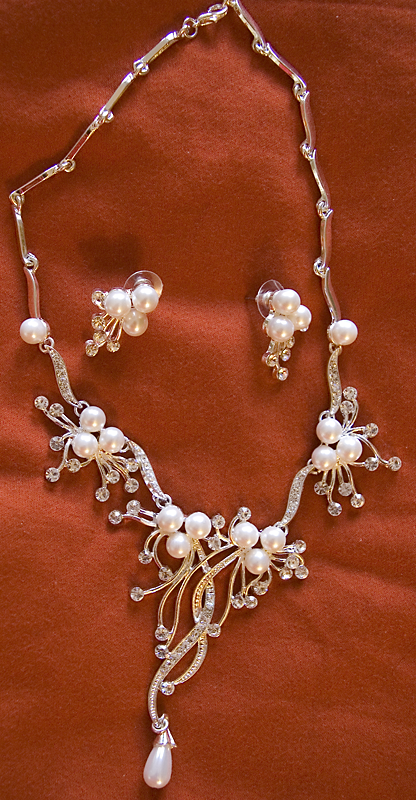 Whether you’re looking for something spectacular to wear for your trip down the aisle (and, like me, you know that – even though real diamonds and pearls are fabulous – you aren’t likely to wear something quite so ornate more than the one time), a gift for someone or simply some stylish day-to-day sparklies – you’re likely to find something at this site. I have. Several times. By the way: Mothers’ Day is right around the corner. Why not pick up something nice for yours? This entry was posted on Thursday, April 15th, 2010 at 12:27 pm	and is filed under The Confessional, The Purchases. You can follow any responses to this entry through the RSS 2.0 feed. You can leave a response, or trackback from your own site. I like your last statement. Good idea! Read my ramblings in order, starting with thefirst post.